Revival House: "You guys wanna go see a dead body?" 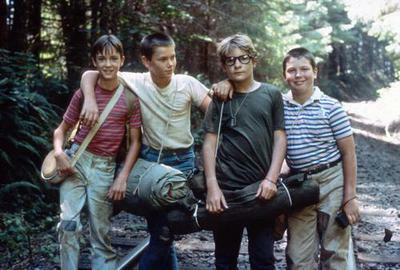 As Stand By Me turns 25, Revival House takes a look back at a coming-of-age classic. Twenty-five years ago, on August 8, 1986, Rob Reiner’s Stand By Me opened in limited release (opening in wide release on August 22). In 1982, one of my favorite Stephen King books Different Seasons was published, consisting of four novellas that each correspond to a season of the year. I love this book so much because three out of the four tales do not have anything whatsoever to do with the supernatural — a bit of a departure for King. One of his strengths as a writer is his ability to create real flesh and blood people who populate his stories, no matter how crazy things get. This ability especially shines in Different Seasons, and anyone who doubts the writing talent of Stephen King should read at least one of the stories from this book. Three of the four stories, the same three that do not rely on anything supernatural, have been made into films — the first being Stand By Me which was adapted from The Body. The second film to come from this source was The Shawshank Redemption (1994), Frank Darabont’s flawless adaptation of Rita Hayworth and Shawshank Redemption. Unfortunately my favorite of these stories, Apt Pupil, failed as a film (released in 1998), mainly due to the fact that director Bryan Singer and screenwriter Brandon Boyce changed the ending so significantly that they pretty much rendered the rest of the story pointless. The screenplay for Stand By Me, by Bruce A. Evans and Raynold Gideon (who also wrote 1984’s Starman) is remarkably faithful to its source, right down to the moment where Gordie encounters the deer — one of my favorite little incidents from King’s story that I couldn’t believe made it into the movie. Future adapters of Stephen King material take note: it’s the small character moments like this that make me an admirer of the author’s work, and leaving such moments out of the movie — even though they might not advance the plot — is utterly stupid. It is a testament of Rob Reiner’s directing skills that he was able to not only so successfully cast the four young leads, but also that he managed to get such honest performances out of each of them. Corey Feldman has never been better as the crazy, bitter, angry Teddy Duchamp. Jerry O’Connell is perfect as Vern Tessio. And of course River Phoenix shines in the role of Chris Chambers, the kid who believes he was born with no chance in life, who in one heartfelt moment confesses to Gordie that he wants to move away to a place where no one knows him. Playing Gordie Lachance is a very young Wil Wheaton, in what I was certain at the time was a star-making performance. He’s so downright perfect in this role, it will always remain a mystery to me why his acting career never quite took off the way I imagined it would, especially after demonstrating his ability to carry a movie like he did. Of course all of us nerds are well aware that Wil Wheaton grew up to become — not unlike the adult version of his character — a great writer. 25 years ago, I sat in the theater pretty much stunned by what a solid adaptation this was. I couldn’t believe the entire Lardass Hogan story even made the cut. I had snuck a bottle of Mickey’s Big Mouth into the movie theater, and by the end, with a little buzz going, was profoundly effected by the ending, which I found even more emotional than the book — probably because of the way Chris Chambers disappears from the frame, or the way that the older Gordie looks back on his childhood while at the same time watching his own young son interact with his friend. 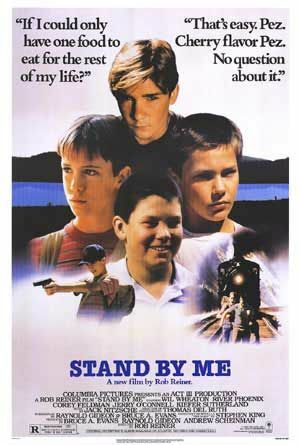 Ultimately, Stand By Me is my favorite film about kids beginning the transition into adulthood, a coming of age story that made me reflect the most about my own childhood and the friends that I had when I was twelve. I just don’t understand how this movie is now older than I was when I first saw it. Jesus, does anyone?